“Brand Journalism” is increasingly popular with marketers but is still eyed with suspicion by traditional journalists. The problem stems from the phrase itself. What is marketing, and what is news? Is there any room for impartial reporting if the journalists are employed by a brand? 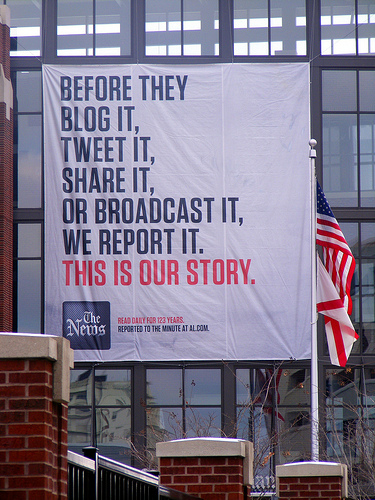 Can fair or in-depth news reporting truly coexist with brand development? By this definition Ragan’s idea is to create content that “blends in” — and I think that is grossly misunderstood in an age of increasing transparency. This advice reminds me of the faintly printed “Special Advertisement Section” advertorial notice in (yesterday’s) newspapers and magazines. There is a generational shift in thinking between journalism and news customers and it involves less friction and fewer middlemen. Custom content has been around for a long time but I agree with Matthew Ingram’s assessment: “This is about more than just advertorial — it’s about brands going direct.” Direct connection between brands, their curated news, and their audiences is the new norm. “Brand journalism is not new, as it has silently taken off with the explosion of social media, but in the last few years it has evolved,” reports an uncredited writer at PRxDigital. This writer cites Red Bull launching its own magazine in 2007 entitled The Red Bulletin. Well-known is Red Bull’s latest space jump, brand-built media frenzy. Could you call that venture “brand journalism”? Or is it “just” marketing? “Journalists may come in many stripes, but skepticism is never far from the surface,” writes British media critic Helen Edwards. Edwards’ take is that “brand journalism” would best be of service using journalists to examine and report on supply chains, internal practices, management, and other business processes. In other words, “brand journalists” should be “real journalists” reporting on the good, the bad, and the ugly. I agree that society is well served with journalists investigating corporations and brands — certainly, corporate abuses are a serious matter. Yet, brands themselves benefit from enlisting journalistic capabilities. One of the best-known news outlets to open up to “branded content” produced by stringers is Forbes.com. Chief Product Office Lewis D’Vorkin isn’t apologetic and sees branded content (or branded news) as the emerging future. Getting into the sanctimonious mosh pit of editorial objectivity and journalism ethics is to enter into a surreal religious war on a pointless par with the dyophysite controversies of the fifth century: no one cared except the patriarchs and metropolitans but nevertheless wars were waged and people died. Brand Content “More Cutting Edge”? Could working with brands allow for greater creativity or more granular exploration of “news”? Some contributors think so. This box that Sakuma is referring to is negative reporting. ‘Working for news outlets, the top stories were always the bashing stories of some company, personality or theme,’ Sakuma added. Brand journalism allows companies to tell stories that fall outside of the negativity of traditional news media coverage and cultivate an audience that is interested in the positive side of the story. What does good brand journalism look like? It isn’t a sales pitch. It’s main goal is to inform a reader (or viewer) through the standard journalistic tools of narrative, emotion, and imagery. It’s transparent. Credibility goes down if a company tries to hide its involvement with the content. It’s interactive. Readers should be able to leave and view comments, and companies should tolerate all but the most inappropriate interactions. In short, we’re in a period of flux. Evolution isn’t easy, but it’s not going away. Brand journalism is here to stay.